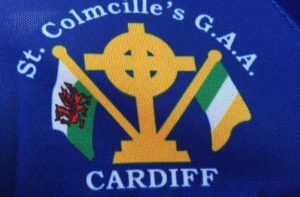 A hat trick from Cardiff full forward Alan Burns helped St Colmcilles overcome St. Nicks of Bristol in a cracking game of football in Pontcanna Fields Cardiff on Sunday last. The level of football played by both sides was impressive and undoubtedly the game of the year so far in the Gloucestershire Football League. County chairman Kevin McDonagh got proceedings underway in the Cardiff sunshine as the two Gloucestershire rivals set about trying to ensure that they extended their respective league campaigns for another few weeks. Cardiff started brightly with Keiron Maguire getting the opening score of the game with a well struck point from a tight angle. St Nicks replied with 2 points from frees followed by Cardiff’s tireless Ciaran Slevin finding some space, beating two defenders and kicking a great point on the run to level the game. St Nicks then took the lead with a goal, the ball was placed firmly into the corner past the on rushing Cardiff keeper Aidan Farrelly. Cardiff responded almost instantly as a precise kick out from the Cardiff custodian found Kevin Smyth who had made a very intelligent run out wide before laying off the ball to Dan McCool. Dan picked out Keiron Maguire with a well placed pass before Keiron created his own scoring chance and brilliantly took the opportunity. Cardiff then regained the lead after some good work by David ‘Tack’ Quinn ended with him furnishing Cardiff full forward Alan Burns with a pin point pass. Burns slotted the ball under the St Nicks goalkeeper to put Cardiff back in the driving seat. This would be the Welsh side’s last score of the half as St Nicks enjoyed a purple patch during which they made sure that the lads in the electronic scoreboard wouldn’t be dozing off. Cardiff then paid the price for their own eagerness in the tackle as a series of frees resulted in St. Nicks kicking four unanswered points to go in a half time leading by 1-6 to 1-3. McVities may well consider a restructure in the marketing department such was the impact that the half time Jaffa Cakes had on the Cardiff team. With the change in tempo from the first half performance one would wonder if they may be the missing link that could finally get Mayo over the line. Possibly a stretch. Des Foley was like a roadside strawberry stand in Wexford in the second half, everywhere you turned, there he was. He tackled, chased and dispossessed as he found himself deployed in a slightly deeper role and dictated the play with consummate ease. 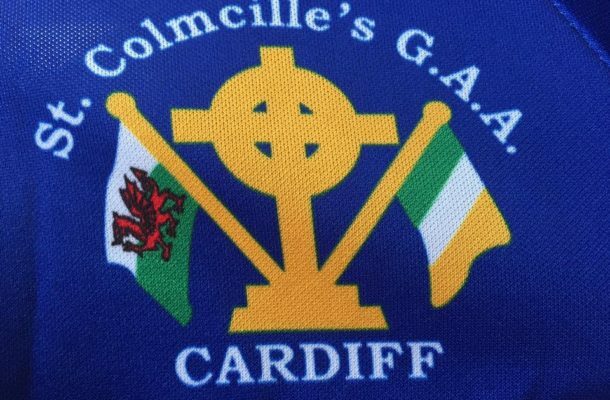 St Colmcilles were without Cardiff veteran Barry McDonnell for the first time in living memory but the full back line of Daire Foley, Cathal Garvey and chief organizer Martin Doyle kept things tight and ensured that St Nicks would be living on scraps in front of goal. Communication was key for Cardiff as the defence were very disciplined when going forward, testament to the great work being done by Mossy Burke behind the scenes. Keiron Maguire pointed from a free before the excellent Ciaran Slevin again turned the Bristol defence inside out before taking his second point of the game. At the other end Johnny Murray dominated the central line for Cardiff assisted by the imperious Des Foley. Another 2 points from frees kept Bristol in front until a great ball from Dan Corrigan was won by Will Holton who drew his man and found the Dun Laoghaire dynamo Ciaran Monaghan who was bursting into the area before being dragged down. Cardiff’s man with a plan was Alan Burns who stepped up to slot the penalty home and put Cardiff in front. Minutes later he would have his hat-trick as a great ball by David Quinn beat the Bristol defence and Alan showed great awareness to punch the ball over the onrushing keeper and into the Bristol net. St Nicks rallied but another superb goal and point from Cardiff sub Paul Quinn ensured that it was all in vain. More great work from a combination of Dan McCool and Ciaran Monaghan fashioned some space for the brilliant Keiron Maguire and he settled the game with its final score, again from a very tight angle. The Cardiff defence were well drilled and kept St Nick’s honest as they snuffed out attack after attack. The combination of Kevin Smyth and Ciaran Monaghan in the Cardiff engine room worked tirelessly throughout and kept the ball going in to the forward line. As the saying goes, goals wins games and it proved true on the day but as team manager Marty Dolan mentioned after the final whistle, there is no silverware given out for getting to finals. A huge thank you to all of our supporters, partners, friends and well wishers on the days for their support. We will go again in a few weeks and look to step it up another few levels against St Judes of Bournemouth in the League Final in Bristol. All support is welcome.